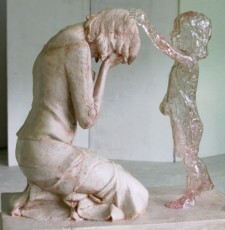 Martin Hudáček, creator of the sculpture (pictured) entitled, “The Child Who Was Never Born.” A group of young mothers in Slovakia commissioned the statue dedicated to the unborn. Or e-mail us at wyandotcountyrighttolife@gmail.com for more information. I am the author of 2 children’s picture books called Now I’m a BIG Girl and. Now I’m a BIG Boy. They show human development in a sweet, cartoonish way. Some were purchased at an Ohio Right to Life state meeting, and Mercer County (Ohio) Right to Life bought 50 for placement in doctor’s offices.I am at the fairgrounds in Upper Sandusky right now with a book display. 3 of my other books show respect for life from different perspectives.